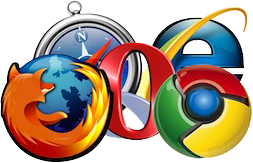 FAQ: What is a browser and which browser am I using? The browser is the program you are using to view this site. While most people use Microsoft’s Internet Explorer, Firefox and Google’s Chrome have big followings. If you use a Mac, you might also use Safari. With so many to to choose from, people may be reluctant to try another brand, even when others claim the benefits of one over the other. Each one has its own advantages and disadvantages depending on what you are doing. What is a browser and what browser am I using? How to update your browser version?